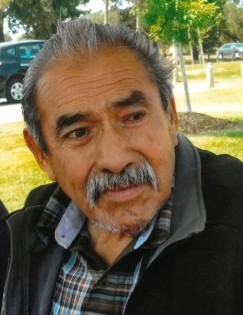 Joseph Alvarez Moreno Sr., 77, passed away at home in Oceano on Feb. 3, 2019. Joseph was born in Texas to Emerando & Cirila Moreno. He was one of eleven children. Joseph was a veteran of the US Army. He was the ranch foreman at Dohi Farms and a member of the Knights of Columbus. His hobbies were hunting with both rifle and bow. He enjoyed taxidermy work and watching his grandkids play sports. Joeseph loved to BBQ with his family, talking with people and exchanging stories. Joseph is survived by his spouse Terry Moreno; Son Joe Moreno Jr.; daughter Cynthia Moreno; 8 grandkids and 9 great grandkids. A memorial service will be held Friday, Feb 15th at 10 am at Marshall-Spoo Sunset Funeral Chapel. Burial with Military Honors will be at Arroyo Grande Cemetery.